I remember how, as a new teacher, I would attend a professional development and feel inundated with new strategies. (I wanted to get back to the classroom and try them all!) After the magic of that day wore off, I reflected on the many strategies and would often think, "Lots of great stuff, but I'm not sure it's worth the time it would take to implement it all." This leads me to educational researcher John Hattie, who wrote Visible Learning for Teachers: Maximizing Impact on Learning. Through his research, one of his goals is to aid teachers in seeing and better understanding learning through the eyes of their students. 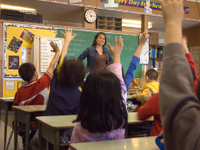 When a teacher begins a new unit of study or project with students, she clarifies the purpose and learning goals, and provides explicit criteria on how students can be successful. It's ideal to also present models or examples to students so they can see what the end product looks like. Teachers need to frequently step offstage and facilitate entire class discussion. This allows students to learn from each other. It's also a great opportunity for teachers to formatively assess (through observation) how well students are grasping new content and concepts. How do learners know they are moving forward without steady, consistent feedback? They often won't. Along with individual feedback (written or verbal), teachers need to provide whole-group feedback on patterns they see in the collective class' growth and areas of need. Students also need to be given opportunities to provide feedback to the teacher so that she can adjust the learning process, materials, and instruction accordingly. In order to provide students with effective and accurate feedback, teachers need to assess frequently and routinely where students are in relation to the unit of study's learning goals or end product (summative assessment). Hattie recommends that teachers spend the same amount of time on formative evaluation as they do on summative assessment. Students are given opportunities to plan and organize, monitor their own work, direct their own learning, and to self-reflect along the way. When we provide students with time and space to be aware of their own knowledge and their own thinking, student ownership increases. And research shows that metacognition can be taught. Great teachers are earnest learners. Spend some time with a colleague, or two or three, and talk about what each of these research-based, best classroom practices looks like in the classroom. Discuss each one in the context of your unique learning environment: who your students are, what they need, what they already know, etc. How do you already bring these five classroom practices alive in your classroom? Please share in the comments section below.